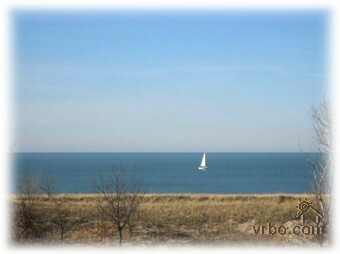 Michigan City Indiana Sheridan Beach Lakefront Rental Home. This beautiful, spacious, new construction 4 bedroom, 4.5 bath lakefront home is privately located on Lake Michigan in Sheridan Beach. This 4 level home offers beautiful views of Lake Michigan from each level. The Master Suite also has a private bath, and a view of Lake Michigan. This is a high end property that is professionally cleaned and well maintained. This home is located in the best area of Sheridan Beach away from the congested rental area and close to Beachwalk but not too close. The rolling sand dunes and the 2-3 foot dune grass that grows on them have become the signature of Sheridan Beach, and make this area a cherished vacation spot. Enjoy our back yard with a large grassy area to play bags or horseshoes. Our home is 200 yards from the beach with no other homes between our home and the beach. Our home is within walking distance from Washington Park, The Zoo, The Marina, with daily and weekly boat slip rentals and where sailing and fishing charters can be booked, and four restaurants. Attractions in the area include the Blue Chip Casino, Four Winds Casino, Lighthouse Outlet Mall, fine dining, wineries, Lubeznik Center for the Arts Art Museum, Ragtop Auto Museum, Michigan City Library, numerous golf courses, mini-golf, go-carts, water park, skate and bike park, jet ski rentals, charter fishing, charter sailing, and the Indiana Dunes National Lakeshore and State Park. Whether you enjoy boating, fishing, swimming, hiking, biking, shopping Michigan City has something for everyone you wont be bored! The Indiana Dunes National Lakeshore Park boasts 8,500 acres of lakeshore nature preserves, bogs, forests, and enormous sand dunes. These dunes inspired the poet Carl Sandburg to write "The dunes are to the Midwest what the Grand Canyon is to Arizona and the Yosemite is to California. They constitute a signature of time and eternity." While hiking the dunes, you will find an assortment of wild shrubbery that can’t be matched. Michigan’s Harbor Country is only 15 minutes away. Enjoy two states at once while staying at our beautiful home in a truly great location. Please note this is a smoke-free and pet-free environment. Lakefront View of Lake Michigan from the deck .